These test strips offer both versatility and sensitivity without compromising accuracy. 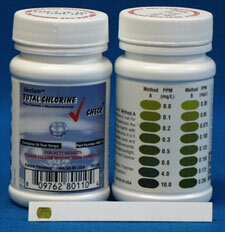 Ranging in sensitivity from 0.05 to 80 PPM (mg/L), Total Chlorine strips use patented technology to make your testing easier. You see the results in less then a minute.